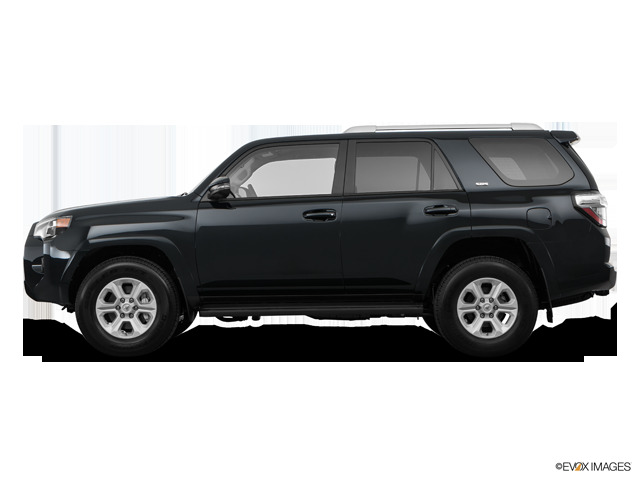 Description Midnight Black 2019 Toyota 4Runner SR5 RWD 5-Speed Automatic with Overdrive 4.0L V6 SMPI DOHC 3.727 Axle Ratio, 4-Wheel Disc Brakes, 8 Speakers, ABS brakes, Air Conditioning, Alloy wheels, AM/FM radio: SiriusXM, Anti-whiplash front head restraints, Brake assist, Bumpers: body-color, CD player, Driver door bin, Driver vanity mirror, Dual front impact airbags, Dual front side impact airbags, Electronic Stability Control, Emergency communication system: Safety Connect, Exterior Parking Camera Rear, Front anti-roll bar, Front Bucket Seats, Front Center Armrest, Front fog lights, Front reading lights, Front wheel independent suspension, Heated door mirrors, Illuminated entry, Knee airbag, Leather Shift Knob, Leather steering wheel, Low Fabric Seat Trim, Low tire pressure warning, Occupant sensing airbag, Outside temperature display, Overhead airbag, Overhead console, Panic alarm, Passenger door bin, Passenger vanity mirror, Power door mirrors, Power driver seat, Power steering, Power windows, Radio: Entune Audio Plus, Rear anti-roll bar, Rear seat center armrest, Rear window defroster, Rear window wiper, Remote keyless entry, Roof rack: rails only, Security system, Speed control, Speed-sensing steering, Split folding rear seat, Spoiler, Steering wheel mounted audio controls, Tachometer, Telescoping steering wheel, Tilt steering wheel, Traction control, Trip computer, and Variably intermittent wipers. Legendary Low Pricing at Mark McLarty Toyota. *Picture may not represent actual vehicle. Price varies based on Trim Levels and Options. See Dealer for in-stock inventory & actual selling price. All prices plus tax, title & license with approved credit. MSRP includes delivery, processing, and handling fees. Dealer doc fee $129.00 not included in the price. Prices may be different outside of each advertised period and do not necessarily reflect cash price at any other time. **With approved credit. Terms may vary. Monthly payments are only estimates derived from the vehicle price with a 72-month term, 4.9% interest and 20% downpayment.